The Susaworld waits with baited breath, high expectations, tremors, swoons, deliriousness, Depends, and lunacy. Will they finally get their answer? The countdown is beginning! WHAT is Tweety Bird? LOL!!! Yep, it's going to be really interesting to see if he actually does show up there! Scottish and British Customs are reporting a huge influx of cats named Sylvester. That means that Mighty Spuds is on the way! Mister Spuds will join the fight! Please Twitter tweet any sightings of Tweety. I wove wittle puddy his coat is so warm. And if I don’t hurt him he’ll do me no harm. Obama had to show a birth certificate. Why not Tweety? He is the one who claimed he was 37 years old for at least 2 1/2 years. Forget WHAT is Tweety Bird. 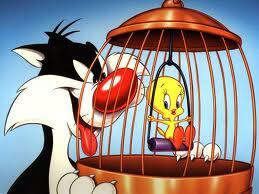 The question now is WHERE is Tweety Bird? No word about the many hours of travel. 5 days of NO posts.......WHERE IS TWEETY BIRD??? Maybe he is on leave to get his "doc"torate! DocTweety! I still say that when it's all over he's going to say that he was there but no one will have seen him. 6-7 days of no posts and no tweets! Now, no word of any Tweety sighting in Newcastle! We now know why a quilter was in Blackbern this weekend. Another bedding surprise. Perhaps he's giving Billy Batsh*t spelling lessons? Are we talking about the President of Chile or the US here?? No one is even responding to questions about Tweety! Security must be intense. Not going to Newcastle, due to earthquake in Chile!! What a convenient earthquake!! We had a poll here a week ago----we must be seers!!! Will Kalua be In Newcastle? 3. Yes-an actor portraying him. He probably was not in Chile when the earthquake happened! Did he quickly fly back there? The quake was 2 days ago--funny the announcement was not made till today. It was also around 134 miles away from where he claims to live. Maybe he was needed to captain one of the naval ships. Nah, he'd have boasted about that to get some more lovin' from his 'harem'. Oh he's there. He doesn't miss a trick. Subject: Re: What Is Tweety Bird?